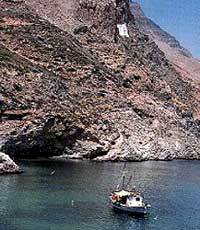 Mountainous and infertile, with a coastline that in some places is steep and rocky while in others it forms quiet, shady bays, this is the furthest east of the all the Cycladic islands. The white-washed houses of the island's capital, Hora or Amorgos, are built around the Venetian Kastro perched on the top of the hill. 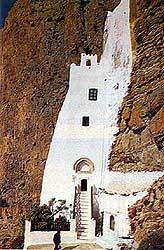 The typical Cycladic ecclesiastical style of architecture, with double or "twin" churches, is much in evidence here. On a rocky promontory to the north-east of the Hora is the Byzantine monastery of Panagia Hozoviotissa, one of the most important monuments of its kind. In Katapola nowdays the island's chief port, is the interesting church of Panagia Katapoliani, built on the site of the Sanctuary of Apollo. The island's second port, the picturesque village of Egiali (which actually consists of three little hamlets of spotless white island-style houses) is renowed for its fantastic sandy beaches. It is in fact easier to approach the village of Arkessini, built near the site of the ancient town with the same name. Ruins that are scattered over the island as well as some remarkable finds (some of them now housed in the National Archeological Museum in Athens) signify not only that the island was inhabited in prehistoric times, but that it was at its peak during the period of the Cycladic civilisation. In all there were three independent townships that prospered here in antiquity. Minoa, Arkesina and Egiali. There are also ruins of the ancient town of Minoa. 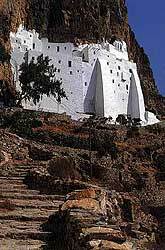 If you visit Chora take the time to visit the monastery of Panayia of the Presentation. To see the monastery it is a fair climb but should not be missed. The islanders in the past had the reputation of being pirates. If you enjoy underwater fishing you should visit. The only problem you might run into is when the meltemi is blowing the weather conditions are severe. Ormos Kolofana- This is a small bay near the southern tip. A nice place for a swim but with the meltemi there is quite a swell. Kalotiri- You should anchor in the NW side of the bay. Again with the meltemi you will encounter strong winds. Stay close to the north side rather than the south where the waters are shallow. Agios Panteleimon, Agia Anna, Paradisia, Kalotaritissa and last but not least Egiali. In Hora, Katapola and Egiali there are clubs, bars and pubs.